Wendy Vitter, Donald Trump’s nominee to serve as the district judge for the Eastern District of Louisiana in New Orleans, appeared before the Senate Judiciary Committee on Wednesday morning. 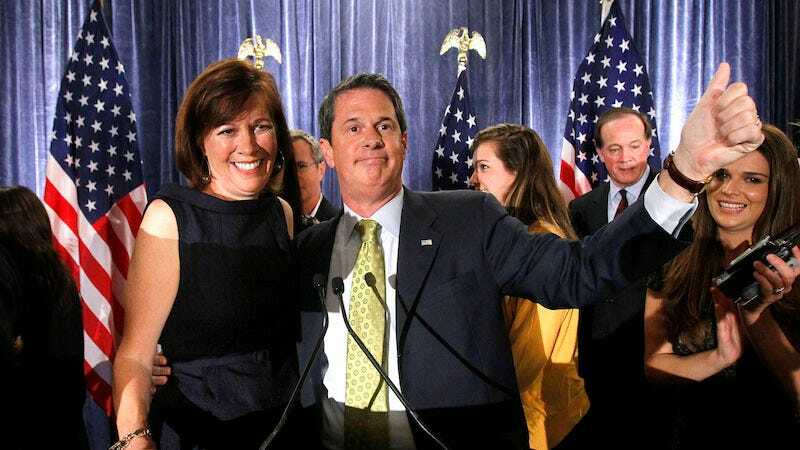 If Vitter’s last name is familiar, it’s because she’s the wife of former Senator David Vitter who, in 2007, admitted ties to a D.C. prostitution ring. Since 2012, Vitter has served as the general counsel for the Archdiocese of New Orleans and, as noted by many critics of her nomination, has limited experience in a courtroom. Her nomination is vigorously opposed by women’s groups, including Planned Parenthood, which has spent thousands of dollars on a digital campaign opposing her confirmation. Vitter is deeply anti-abortion, as is the case for many of Trump’s judicial appointments, and also initially failed to disclose to the Senate her history of public appearances and speeches, including a panel she led in 2013 called “Abortion Hurts Women” during the Lousiana Needs Peace Conference. NPR reports that while Vitter has since amended her disclosure form, “that sort of supplemental filing was not acceptable to Republicans when the shoe was on the other foot during the Obama administration.” That was, predictably, not the case for Republicans during Vitter’s hearing today. Vitter’s failure to disclose, as well as her association with extreme anti-abortion views, were only an issue for Democrats on the Judiciary Panel. Of particular interest to Senators Hirono and Harris was Vitter’s participation in the 2013 anti-abortion conference. At the 2013 conference, Vitter staked out anti-abortion and anti-birth control positions that range from standard to extreme. She praised Texas’s TRAP laws, arguing that they were passed to protect women and their health (despite evidence otherwise). While moderating a panel sponsored by Lousiana Right to Life, Vitter endorses a brochure called “The Pill Kills,” from the anti-abortion Breast Cancer Prevention Institute, that links oral contraception with cervical, breast, and liver cancers, as well as suicide and “violent death.” The brochure posits that women who are on the pill are more attracted to men who are genetically similar. That similarity leads to “less healthy” children and infidelity, thus producing intimate partner violence. “These effects impact the quality of spousal relationships and no doubt are a reason for the fact the greatest cause of death of pregnant women is homicide,” the brochure reads. It adds that “studies have shown that women off the Pill are rated more attractive by men.” The claims presented in “The Pill Kills” are a mix of outright false claims and misleading interpretations of single studies. Democrats on the Judiciary panel asked Vitter about her comments, her anti-abortion activism, and her endorsement of the brochure, “The Pill Kills.” Vitter largely evaded the questions, insisting over and over again that she would set aside her personal and political beliefs and follow precedent. Democrats Mazie Hirono and Kamala Harris, as well as Richard Blumenthal, pushed Vitter on her responses, but Vitter was firm in her stance that her anti-abortion position—that has so far shaped the arc of her professional life and is presumably the reason she was selected as a nominee in the first place—would not affect her judicial impartiality. “I do not consider the role of a district court judge to question precedent or in any way overturn it,” Vitter told Senator Amy Klobuchar early in the hearing. It was a talking point she would return to again and again. Hirono asked Vitter about both her endorsement of “The Pill Kills,” as well as her failure to disclose her speaking engagements. “Do you believe the claims [in this brochure]?” Hirono asked. “You urged women to look at this material...you called them facts,” she continued. Vitter tried to place the endorsement “in context.” “I was a moderator of this panel, I was not one of the speakers, I was trying to facilitate a discussion, I did not choose the speakers,” Vitter said. “I’ll be frank, I had never heard those views before.” Vitter said that she was not endorsing the brochure, but encouraging “participants to speak to their medical doctor.” Hirono interrupted, asking, “are you aware that these views have been massively debunked?” “I’m not a medical professional,” Vitter evasively responded. Hirono then pointed out that judges have to apply common sense and asked Vitter if the claims made by Breast Cancer Prevention Institute co-founder Angela Lanfranchi seemed like common sense. Vitter responded that it did not seems like common sense. Vitter said that despite encouraging panel participants to bring the “facts” in Lanfranchi’s brochure to their doctors, she was “questioning” herself as she did so. During her exchange with Hirono, Vitter distanced herself from her comments on the panel, though did not fully deny that she agreed with Lanfranchi’s point of view. During questioning by Harris, Vitter finally said that she found the views unreasonable. “Do you believe that birth control pills cause women to have extramarital affairs?” Harris began. “I had never heard those views before,” Vitter responded. Harris reiterated the question, asking Vitter if she believed Lanfranchi’s brochure represented a reasonable point of view. Vitter dodged the question again. Harris pressed again, asking Vitter again if she believed that the literature she promoted in 2013 represented a reasonable point of view. Vitter finally responded: “No, I do not.” She again reassured the committee that her “pro-life” stance would not impact her ability to judge cases impartially. Harris, Hirono, and Blumenthal also asked Vitter about her comments that Planned Parenthood “kills 150,000 females a year.” Vitter clarified that she was talking about fetuses and reiterated yet again that her pro-life views were clear and on the record though she would set aside her personal beliefs. “I’m not asking you about setting aside your personal views, I’m asking you very simply….do you stand by that statement [about Planned Parenthood],” Blumenthal replied after Vitter dodged a direct answer to his question. “It’s a ‘yes’ or ‘no’” question, he said. Vitter did not give him a yes or no answer. Instead, she said: “My pro-life stance has been made very clear, I have been very upfront with this committee” before stating, once again, that her anti-abortion activism would have no impact on her impartiality or her commitment to precedent, including Roe vs. Wade. Harris, Hirono, and Blumenthal seemed unconvinced.